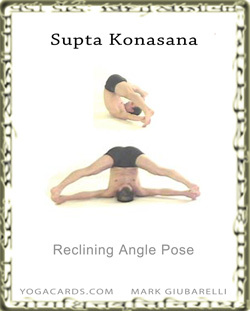 You can enter this yoga posture from Halasana. Bring the knees into the chest rapidly, raising the pelvis and lower back up. Straighten the legs when the lower back begins to rise. Take the legs slowly down behind the head and place the hands into the lower back for support. If possible allow the legs to come all the way down to the mat. Take the sides of the feet and inner heels down if you are really flexible. Open the legs and grab the feet or the toes. You can also hold the big toe and stretch it. Try to stretch the big toes in lots of postures. It will improve the inner energy that runs up the legs and improve Tadasana. The tops of the feet can be on the mat if you point them but for a deeper back and leg stretch push through the heels. Create space around the neck for the elements to flow. It is negative if there is suppression and restricting around the neck. Neck muscles and ligaments are stretched along with muscles in the shoulders and legs. One of the benefits of this posture is the gathering of the water element around the neck. It is apparently good for the thyroid one of the larger endocrine glands. Notice a slight curve along the spine. This distributes the stretch along the spine rather than concentrating it on one part. Quite often these days ,in the quest for Tadasana fundamentals in postures, the spine is straightened as much as possible. This causes tremendous strain in the neck. It restricts air and blood flow in the neck. Allow a slight bend to occur in Halasana and in this yoga posture it is more effective and therapeutic. Allow students to support their back with the hands and arms while bringing the legs down. This will allow better control when entering the posture and protect the neck. If student have a neck injury they may be afraid of this posture. You will see a lot of neck injuries wander into your classes resulting from disc degeneration or from muscle damage due to impact or whiplash. Be careful with these people. None of them will want to enter this posture and you can’t blame them. Perhaps give them a variation and over time work them in to small gentle boundaries.